Why CATterrain? Our low-profile water terrain is guaranteed keep your 'Mechs cool in the heat of battle. The boarder of this water terrain is modeled with an earth-tone mix of brown railroad modeling sand and small gravel that matches our B7 Butte. To add the water effects, the dark blue water area has been dry-brushed light blue. These circular ripples are further accentuated by sculpted, transparent-water railroad modeling putty. The edges of these water pieces are a slightly raised (0.5 mm) 3-D cement blocks that have been coated with a textured, concrete urban gray fleck-stone effect. 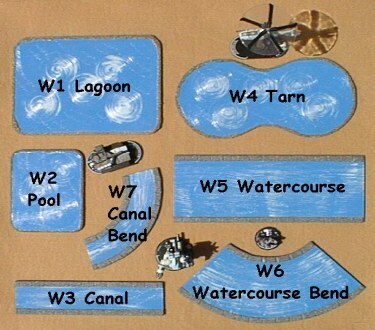 To add the water effects, the dark blue water area has been dry-brushed light blue, sealed and then coated with transparent-water railroad modeling putty. Please note W5 has squared off corners (not round like the WizKids PDF) so as to line up with the W6 piece.